Mittens Musical Teddy Bear by Steiff. This beautiful USA exclusive limited edition hand made piece, in white mohair wears the white ear tag, together with the famous gold plated Button in Ear. Limited edition of only 1500 pieces for the USA. Ashby Bears proudly presents Mittens Musical Teddy Bear. When it is a winter wonderland outdoors, our Mittens Teddy bear is ready for whatever Mother Nature has in store. As the temperature dips below 32 degrees, he dons his warm mittens and makes the best of his time in the cold. 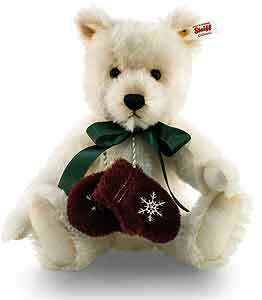 Mittens Teddy is sewn from snow white mohair, has hand-stitched features, and wears a rich satin ribbon around his neck to the side. His mittens are sewn from finest dark red mohair and embroidered with a traditional Christmas snowflake pattern. They are suspended on a festive woven cord around his neck. Wind "Mittens" up and hear his favourite song: "Winter Wonderland," of course!